After a fantastic effort from supporters yesterday, the new section of path on the east side of the main road going north from the Mill Rythe roundabout can now be cycled. I know because this is me riding it! 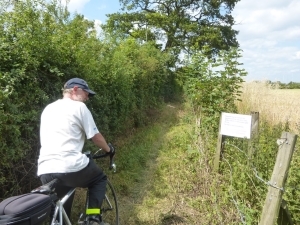 This path may be used with the permission of the land owner until further notice. It is not a public right of way. No dogs or motorised vehicles. 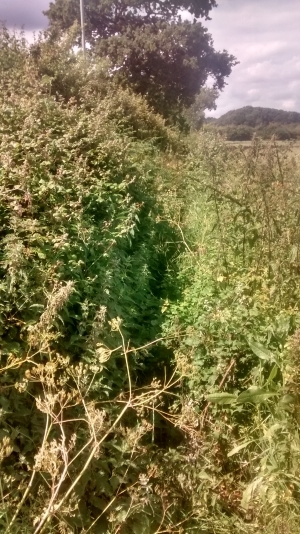 The path was completely obscured by large bramble hedges and clumps of nettles. Looking back it’s hard to believe that this is a picture of the path before we started. Unfortunately, there is more to do. My petrol strimmer/brush cutter did a great job for twenty minutes, or so but then packed up. After letting it cool down for a couple of hours, we revived it for a few minutes before it packed up again. We were therefore reliant on a portable hedge cutter loaned by Keith and Carol Russ and manual labour. If you have the opportunity, please try the path out and let us know how you get on. There were no thorn bushes so you’d be very unlucky to pick up a puncture. The more people that use the path, the easier it will be to get the grass under control. There’s also a possibility the Registered Rider Scheme will continue our effort. If you’d like to help, but haven’t put your name forward, let me know at Andy@CycleHayling.org.uk and I’ll keep you in touch with what’s happening. And to all those that offered help but couldn’t make it. Well done everyone, this is a great result! Great effort, many thanks to all involved.